Throughout our Design Better Work series, we’ve focused on a few big ideas. First, how to strategically design change so you can move your organization forward, and second, why that’s critical in a time when workers crave warm, hospitable environments rooted in authenticity and humanity. As we continue exploring the art (and science) of designing better work experiences, there’s one trend we’d be remiss to exclude—one that has both propelled and complemented the sweeping changes at play in workspaces everywhere: resimercial design. At its core, resimercial design is all about layering in those commonly cherished design elements of our homes throughout everyday commercial spaces, says Adrienne Scribner, ASID, CID, NCIDQ. Think natural materials—like wood, leather, stone, and cozier fabrics—and smaller, more streamlined furnishings that serve multiple purposes. As Baskervill’s Director of Hospitality hailing from our Washington DC office, Adrienne has seen firsthand how ubiquitous resimerical design really is in flags like Moxy. And now, she says, those elements are seeping into the corporate world. 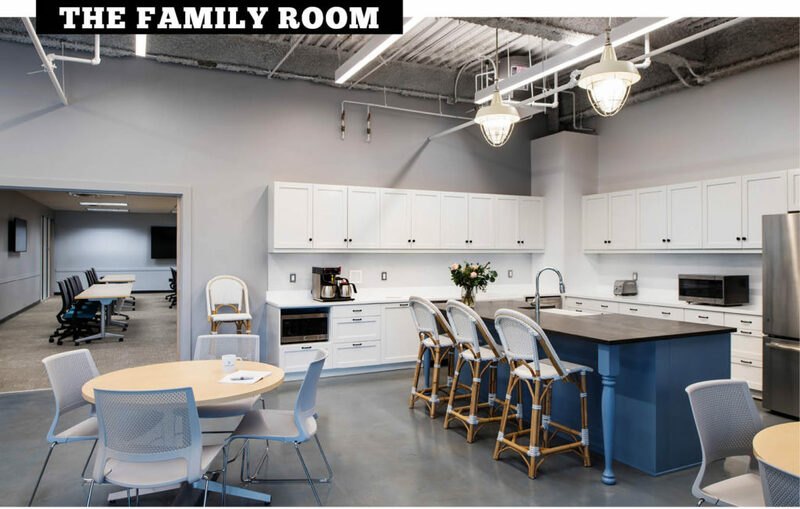 So much so that longtime residential brands like Blu Dot, Restoration Hardware, Crate and Barrel, and West Elm are partnering with large-scale commercial furniture vendors to create spinoff product lines geared toward workspace design. One project taking advantage of the uptick in resimercial? Lansing Building Products, a wholesale distributor of home exterior products. As a third-generation family-owned company, Lansing is deeply proud of its family-like culture. 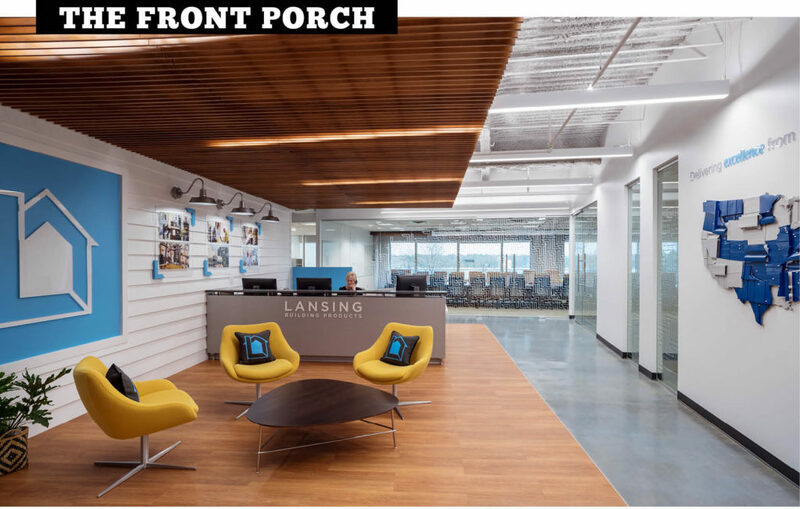 After partnering with Baskervill’s workspace strategy team to make it happen, the final result is a welcoming office that layers in the residential construction products sold by Lansing to evoke a truly homey atmosphere without sacrificing efficiency or pragmatism for the workspace. Inspired by the very best of resimerical design, our team pulled inspiration from (you guessed it) the spots in our homes we love most. For businesses, a successful first impression is a dynamic and honest reflection of a brand’s identify. That’s why our designers crafted a truly welcoming entryway. 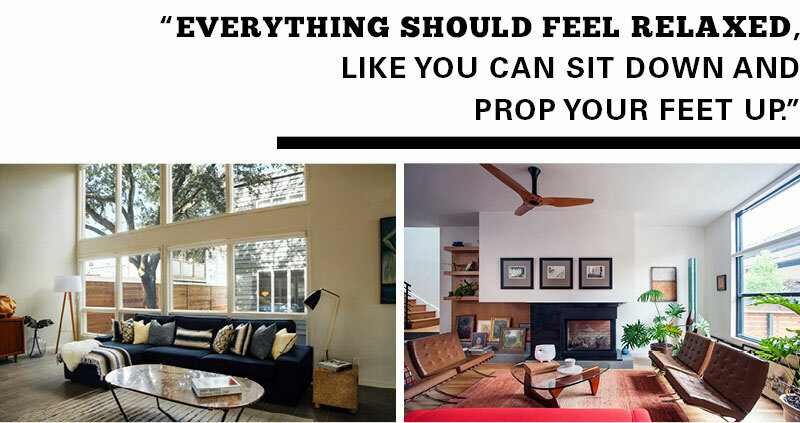 Acting more like a front porch, the space invites guests and visitors to enter the space and gather. A richly-toned wood-slat ceiling defines the space and is complemented by pops of cheery sunshine yellow and sky blue. Exterior siding and rustic light fixtures (used strategically throughout the rest of the office) add texture and depth, while large window frames are repurposed and used as decorative touches. A mix of open workstations and glass-enclosed private offices provide space for solo work, while dedicated training and learning areas and spacious conference rooms offer a range of choice for collaborative meetings. For more informal conversations or creative solo work, our team mixed in relaxed touchdown spots— à la this cozy reading nook. With its ability to exude personality and inspire creativity, artwork is a wildly critical piece to the resimercial puzzle. 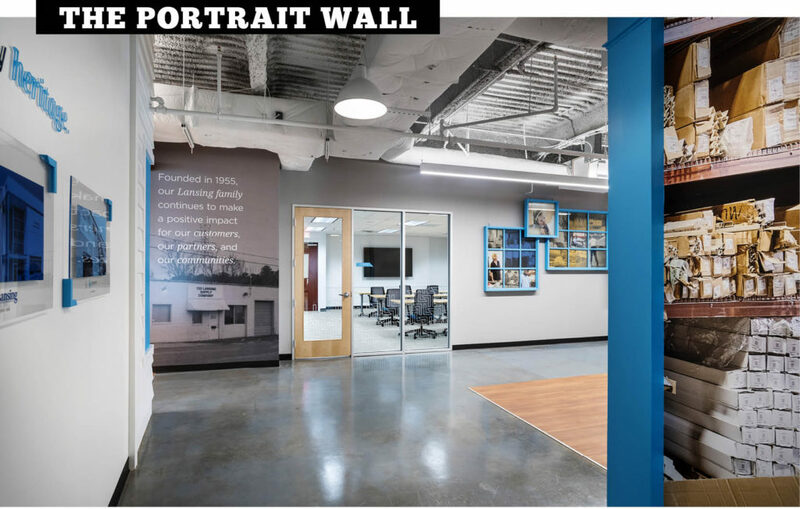 Interspersed throughout the entry and workspace is a series of large-scale graphics (developed by circle S studio) proudly showcasing Lansing’s rich heritage and how the company has grown and evolved since its founding. An epicenter for all sorts of gatherings and creative collisions, this light-filled communal area is called “The Family Room” and features spacious booth seating, a bar-top table, and big windows. To play up the cozy and casual vibe of the space—perfect for lunch, casual meetings, and staff celebrations—our designers sourced elements like the cabinetry and countertops from residential design lines. 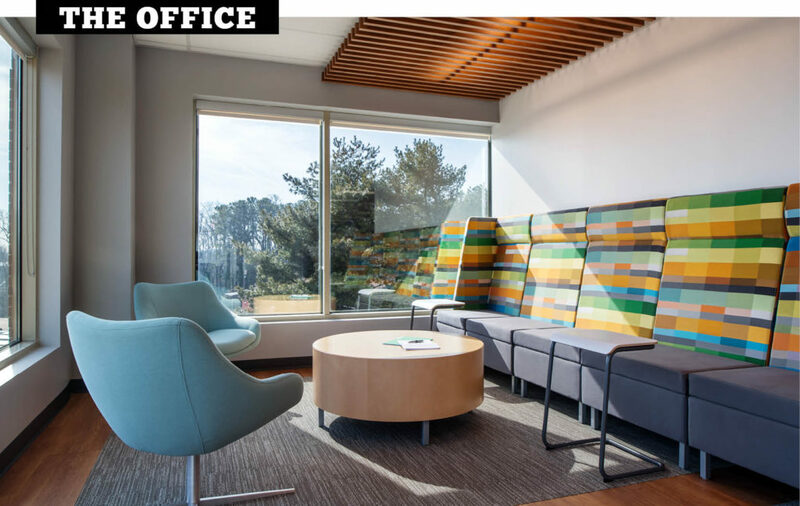 Savvy businesses recognize the multitude of benefits associated with taking a few simple resimercial cues: relaxed atmospheres not only reinforce the very roots of a business’ culture, workers get the space they need to focus and connect with peers. The end result? Productive people, rallied around a united purpose. And in that sense, workspaces truly have become a home away from home: comfortable, familiar, and—most of all—welcoming.